The smallest coin in U.S. history owes its existence to two of the biggest gold rushes. The coin is the gold dollar, a mere pipsqueak physically but a giant in terms of history, rarity and value. The groundwork was laid for this fascinating coin in the Carolinas and Georgia, where the nation’s first big gold rush took place in the early 1800s. That rush had a major impact on U.S. coinage, leading to the establishment of two branch mints in the region—in Charlotte, N.C., and Dahlonega, Ga.—and a sharp boost in the number of gold coins being made by the federal government. The first gold dollars made in the United States were privately minted issues produced about 1832 by a German immigrant named Alt Christoph Bechtler who operated a jewelry shop in Rutherfordton, N.C. Finding that gold dust and nuggets were the primary medium of exchange in the area, Bechtler ran a series of ads in the North Carolina Spectator and Western Advertiser offering to refine raw gold into coins for a nominal fee. By 1840, Bechtler and his family had turned out more than $2.2 million worth of gold coins, of which about half were gold dollars. This was perfectly legal under the existing federal statutes—but, even so, Uncle Sam began to watch the Bechtlers closely. The success of their venture led to calls for government-issue gold dollar coins. In 1836, Congress even authorized such coins, but Mint Director Robert Maskell Patterson opposed the idea vehemently and limited his compliance to striking a handful of patterns. The gold dollar didn’t take its place in the U.S. coinage lineup until 1849, and yet another gold rush—the one in California—provided the spark. The discovery of gold at Sutter’s Mill in 1848 energized Congress to expand existing uses of the metal in U.S. coinage and find some new ones. Mint Director Patterson still was on the scene and still opposed such coinage, but this time his resistance was swept aside. On March 3, 1849, Congress passed legislation authorizing not only gold dollars but also double eagles—$20 gold pieces. Thus did the nation’s smallest and largest regular-issue gold coins emerge from Washington’s womb as fraternal twins. The job of designing both new coins fell to James Barton Longacre, the U.S. Mint’s chief engraver. For both, he came up with a similar obverse design: a left- facing portrait of Miss Liberty with a coronet, or small crown, in her hair. On the dollar, she is encircled by 13 stars, symbolic of the 13 original colonies. The dollar’s reverse is necessarily simple because of the coin’s small size: It bears the denomination 1 DOLLAR and the date within a simple wreath , which is encircled by the inscription UNITED STATES OF AMERICA. Within the Type 1 coinage, there are also two important varieties in the gold dollars of 1849: Some have an “open” wreath, with ample space between the top of the wreath and the number “1,” while others have a “closed” wreath nearly touching the number. Mintages for the most part were relatively high at Philadelphia and New Orleans, but much smaller at the other three mints. In 1850 and again in 1852, the Charlotte and Dahlonega branches made fewer than 10,000 gold dollars apiece. The lowest mintage of all took place at Dahlonega in 1854, when a mere 2,935 examples were produced. Other major rarities include the 1853-D (with a mintage of 6,583) and the 1851-D (mintage 9,882). 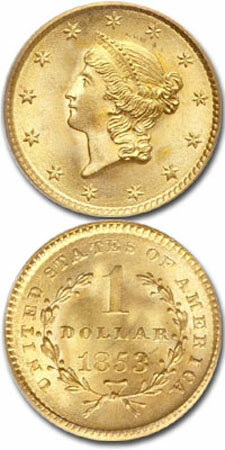 The highest points on the Type 1 gold dollar are the hair near the coronet and the tips of the leaves on the wreath. These are where traces of wear first appear, and thus are major keys in determining grade. Type 1 gold dollars are scarce but available in grades up through Mint State-64, but are rare in MS65, and very rare above that level. Proofs were not struck officially, but the late Walter Breen, a renowned numismatic researcher and scholar, reported that at least seven proofs were made in 1849. Although collected by date and mintmark in circulated grades, the rarity of high grade pieces generally limits collectors to just one example for their type sets. Throughout U.S. history, people have grumbled that silver dollars were too large and heavy to carry around. Gold dollars posed a dramatically different problem: at less than three-quarters the size of today’s dime, they were so small they could easily be mislaid. Make no mistake, though: These tiny coins had tremendous purchasing power—equivalent to a full day’s wages or more for many Americans in the mid-1800s. They also enjoy enormous respect from collectors today, for while they may be diminutive in size, their rarity and value can be towering.